Why does inequality have such a hold on American society and public policy? And what can we, as citizens, do about it? 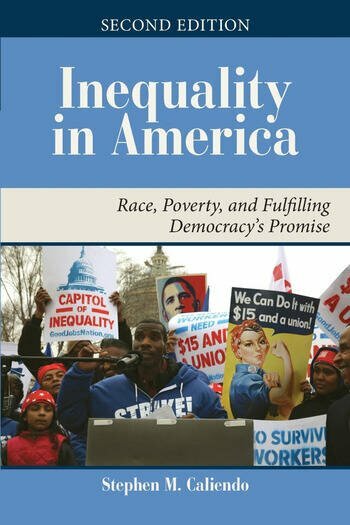 Inequality in America takes an in-depth look at race, class and gender-based inequality, across a wide range of issues from housing and education to crime, employment and health. Caliendo explores how individual attitudes can affect public opinion and lawmakers' policy solutions. He also illustrates how these policies result in systemic barriers to advancement that often then contribute to individual perceptions. This cycle of disadvantage and advantage can be difficult-though not impossible-to break. "Representing" and "What Can I Do?" feature boxes throughout the book highlight key public figures who have worked to combat inequality and encourage students to take action to do the same. The second edition has been thoroughly revised to include the most current data and to cover recent issues and events like the 2016 elections and the Black Lives Matter movement. It now also includes a brand-new chapter on crime and criminal justice and an expanded discussion of immigration. Concise and accessible, Inequality in America paves the way for students to think critically about the attitudes, behaviors and structures of inequality.